So I'm calling this one "nail art blocking" vs. "blocking nail art" because I am actually making blocks of different nail art looks. Blocking nail art, to me, is when the blocking is the essence of the nail art. How's that for logic? 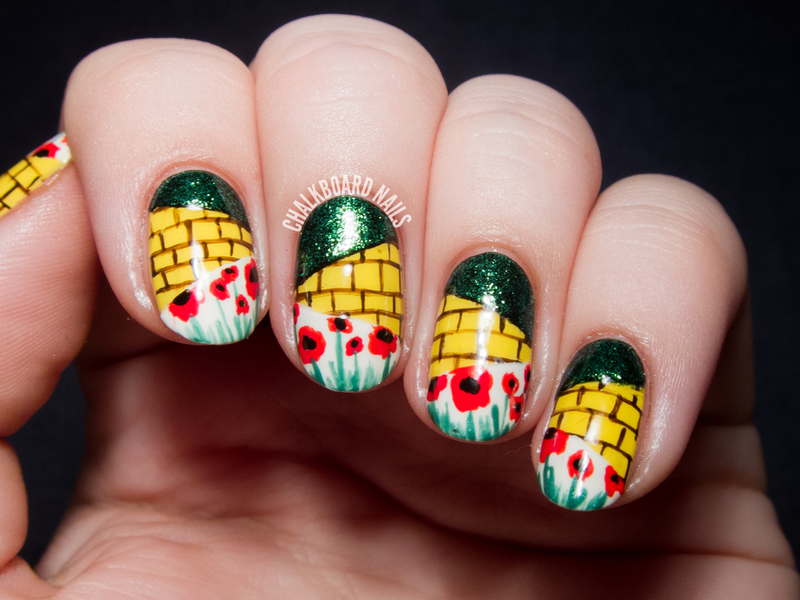 I started by painting my nails yellow and adding the yellow brick road detailing. Then, I added a coat of quick dry topcoat and waited for it to dry completely. I taped off the triangles with painters tape, and then added the Emerald City and poppy fields blocks. A final swipe of topcoat and the mani was done! If I were to do this again, I think I'd try freehanding the sections instead of taping them. I'd also use a lighter color for the brick outlining. I don't think you should have done the brick detail differently. The lines aren't a solid colour which you would expect from brick detailing. I actually love these nails & think you shouldn't be hard on yourself. This may be one of my favorite looks you've ever done! Wow, thankyou! I'm glad you like it so much. I know mentally that I shouldn't be so hard on myself, which may be why I ended up posting it anyway instead of scrapping it and rushing to replace. But still, it does push me to always work smarter! I love it. Super creative and unique. I have had a few manis during this year's challenge where I just sucked it up and posted them. A bummer but it is what it is. 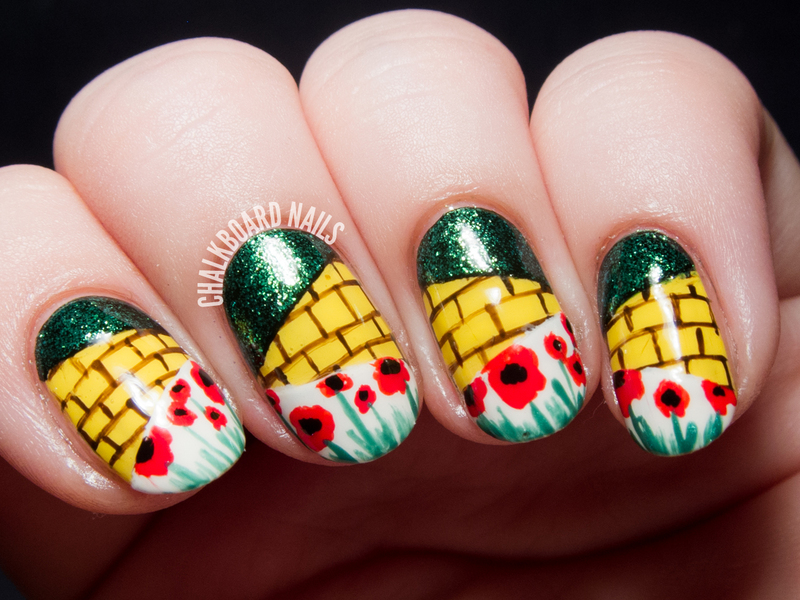 This mani however should not be on your scrap list- it's awesome! Thanks! And isn't it funny how people seem to prefer the manis that you don't like? That's how it feels for me, sometimes, haha. Haha - happens to me all the time! I'm always like "Really?! *shrug* Thanks!" I am loving this so much! It's amazing! This is soo creative! You're too hard on yourself. Girl, there is nothing wrong at all with these, they are actually awesome! These are SO GOOD!! 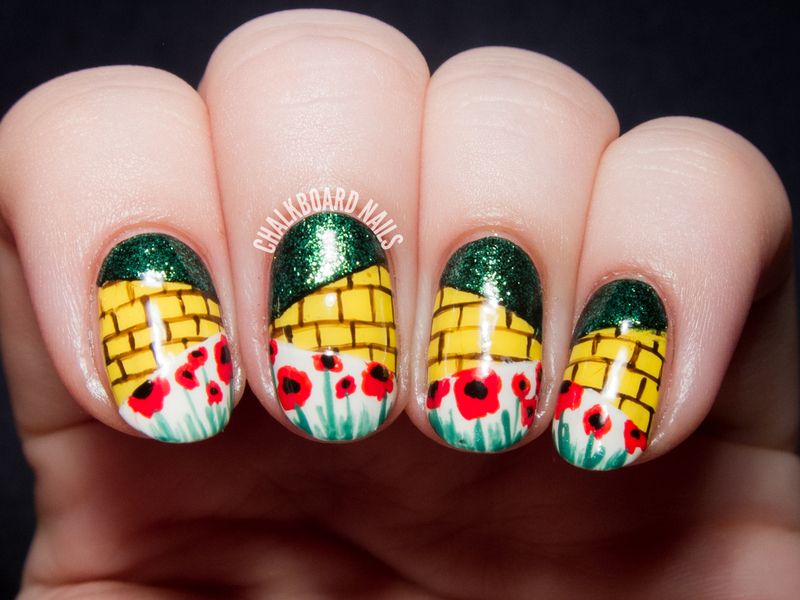 I love the intersecting emerald glitter, yellow brick road and poppies. You really captured the feel of the story!